MACP — As concern grows about the spread of jihadist violence and insecurity in countries across Africa’s Sahara/Sahel after the international intervention and elections in Mali, a new report provides a detailed chronology of documented incidents and reports on terrorist and trafficking connections to the Polisario-run camps near Tindouf, Algeria. 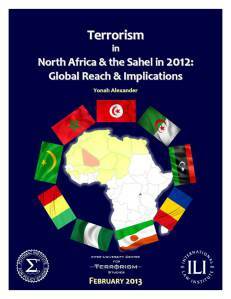 “Security in the Sahara and Sahel: The growing threat posed by the Polisario-run camps near Tindouf,” compiled by the Moroccan American Center for Policy, provides a chronology of documented incidents and expert reports of Polisario-member involvement in illicit activities in the region from 2005-2013. Kidnappings/collaboration with AQIM/MUJAO, including Western aid-workers abducted in Polisario-run camps.